Yes. I still have Halloween candy in my house (my kids must be really cute, because they really brought home a haul last fall). Anyhow, any recipe that will make a dent in “the bowl” is a huge plus in my book. Spud helped me pick out the candies. Once I convinced him that peppermint and peanut butter aren’t friends. And Jolly ranchers and airheads won’t bake nicely, we were on our way to some delicious peanut butter themed brownies. I definitely want to try this again sometime using minty candies. I bet it would be amazing! These brownies barely lasted a day in my house! They were delicious! The best part was that each and every brownie (every bite, really) was completely unique, depending upon how the candies were sprinkled in there. It was a culinary adventure! 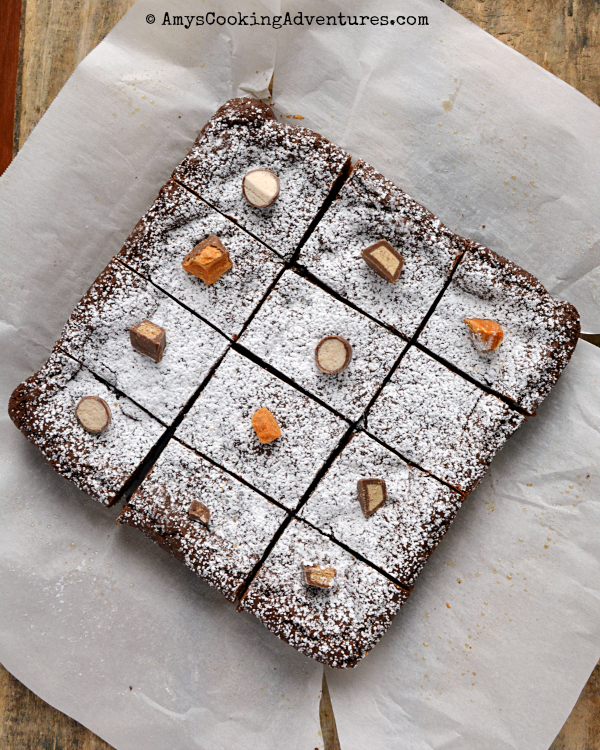 Thank you for a new favorite brownie recipe, Rebekah! *Minty candies would also be amazing! Think thin mint cookies, peppermint patties, crushed peppermints, andies mints, etc. *Roughly chop larger candies prior to measuring. Preheat the oven to 350 degrees F. Line an 8x8-inch pan with parchment and spray lightly with nonstick spray. Stir together the brownie mix, evaporated milk, and butter until combined (the mixture will be quite thick). Pat half of the brownie mixture into the bottom of the prepared pan, coming up just slightly on the edges. Sprinkle the candy mixture evenly over the base. Take the remaining brownie batter and place it over the candies. I prefer to pat small amounts of batter with my hands and place it patchwork over the candies until the candy is completely covered. Alternately, pat an 8x8 square on a piece of parchment and invert it over the candies. Either way, make sure all of the candies are covered. Bake in the preheated oven for 20-25 minutes or until the brownies are done. Cool completely, then sprinkle with a pinch of sea salt and powdered sugar. Lift the parchment to remove the brownies from the pan, then cut into 12 pieces. Want more? Try these yummy recipes! 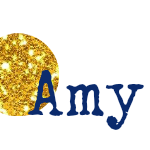 Great choice for this month's reveal Amy. I am so excited to be in the same group with you and happy that Rebekah was assigned here too. You're such a kind mamma! My kids have only been trick-or-treating three times; we didn't take them till they were 9 and 11. Then I let them pick 5 candies to keep, weigh it, pay them per pound, and take the candies to my office. They usually take the money and buy a LEGO set or a book. But I could see this being a great recipe for "the bowl"! They are crazy but sound ike a great way to empty the candy dish! I would like the minty ones, too! 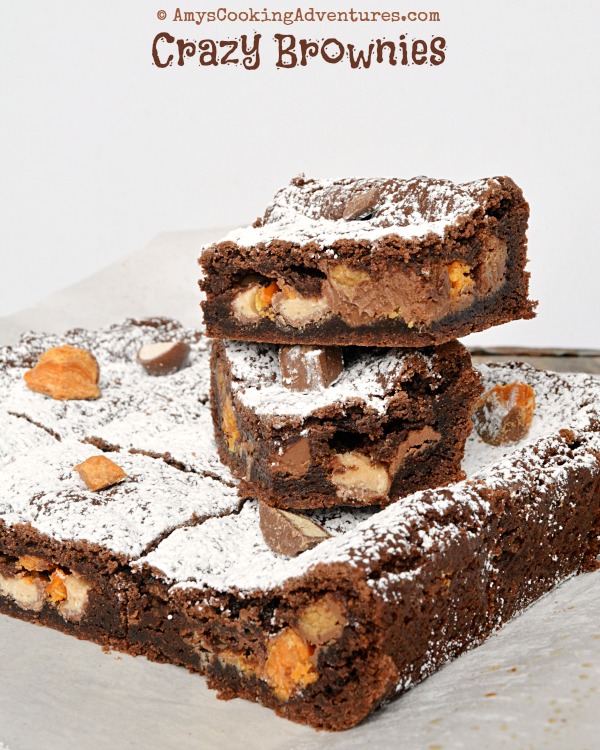 You can never go wrong with a candy-filled brownie! Love the name! Sounds so good! Wow! So much decadence in every bite! i agree with you, the minty ones would be great. I think kids would have a great time picking candies to add. 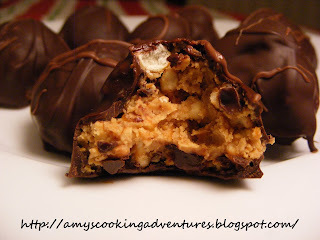 Oh I am totally trying this one for the next treat day at hubby's office. Yum! Visiting from SRC B! Sounds delish. I love that idea for using up Halloween candy. 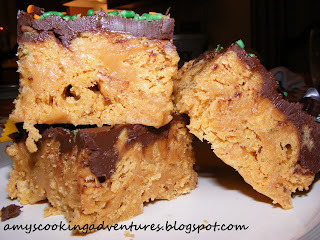 This sounds like a great way to use up Halloween candy or any other holiday with candy. These brownies sound delicious! Love that you tried this one - this is one of my favorite ways to "dress up" boxed brownie mix - so much fun, and such a great way to use up random holiday candies laying around! :D Happy reveal day!